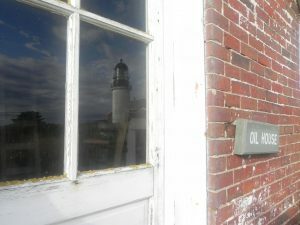 Friends of Seguin Island Light Station (FOSILS) is a 501c3 organization incorporated in 1986 by Anne W. Webster, Patrick Moffatt, S. Sewall Webster, and Nat Chandler. This was due to overwhelming response by locally interested parties to maintain and preserve Sequin Island and the light station. Board members at that time also included Barbara Paiement, Hannah Batchelder, Fred Greene, and Jane Stevens. 1985 – The US Coast Guard automated the light and de-commissioned Sequin Island Light. The four men stationed there were brought back ashore. 1998 – FOSILS was granted ownership of Seguin Island through the Maine Lights Program. 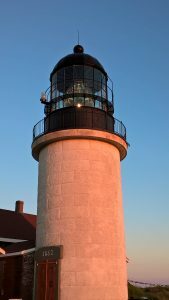 1998 – US Coast Guard announced plans to replace the 1st Order Fresnel Lens with a solar-powered plastic optical one siting costs. FOSILS collected over 7200 signatures in a petition drive to convince the USCG to keep the historic lens. 2006 – Joe Cocking, Ret. 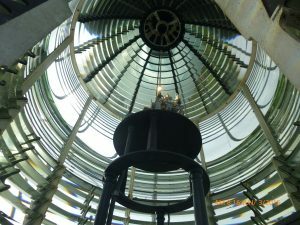 USCG Chief Warrant Officer, and Nick Johnston of Lighthouse Lampshop, Inc. spent the summer cleaned, repaired and polished the historic lens. Since the summer of 1990, FOSILS has opened the island to visitors and has used volunteer caretakers each summer from Memorial Day through Labor Day to help greet visitors, give tours of the tower, museum and gift shop, maintain the island and our 5 hiking trails and host overnight visitors in our guest quarters that are maintained for members of Friends of Sequin Island Light Station. All this is due to our many volunteers, sponsors, visitors and members, whose donations help keep Sequin Island preserved and maintained for future generations. Please join in preserving this magical place in history.